If you missed Stan Lee’s Comikaze this weekend, that doesn’t mean you totally have to miss out. Sure you missed some of the panels, the autographs and even a few costume-ready events, but you can still shop. Bored with nails that are just one color? What about nail wraps for your inner geek? Try Espionage Cosmetics. How about an Army of Vandal Eyes? Then there are Borderlands The Presequel wraps. Like LEGO? Who doesn’t! How about some Building Block nails? Are you wearing a mask as a super hero or super villain? Why shouldn’t your nails also be masked? Love your Circuit Board? You can nail that as well. Then there’s a touch of the Tim Burtonesque as well as something for the Cat Lady in training. Want to have ten tentacles for next year’s Comikaze? How about something more Harlequin? You can also go Power Rangers, Ninja Turtle, really webhead or Steampunk. Each set costs $10 and is pretty easy to apply. Shoes. Do you love shoes? 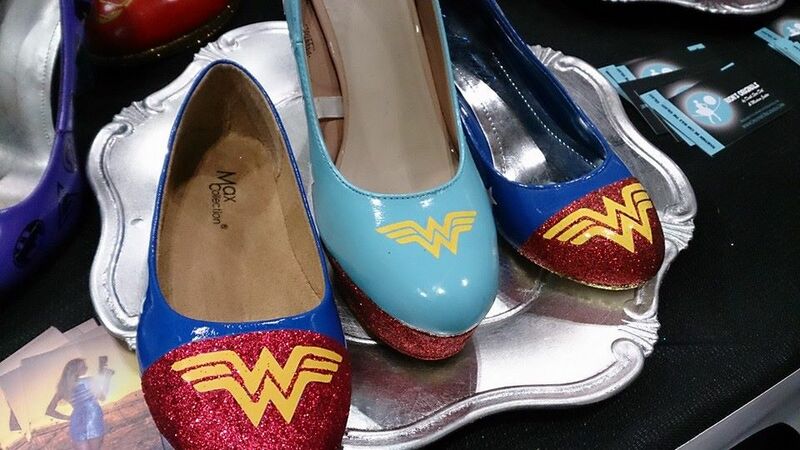 Do you believe that superheroes and superheroines are invincible enough to stand for long hours in a convention line in six-inch heels? If you’re going to suffer that much, those shoes better look good. The San Diego-based Orion’s Originals offers you custom made shoes by DeathStarDoll and Madam Justice. A nice comic heel might not make you laugh, but they will only set you back $150. Flats will run you $80. They also take custom jobs for men and kids (and we’re not saying that men can’t wear those heels). Kids shoes run about $40. All of their examples are hard leather or leather surfaces and not cloth. They are willing to adapt to your wishes and customize any design or design something comic book or movie themed for you. Tim Burton, the Munsters and Vampire movies have brought bats into fashion. Need a wrap? 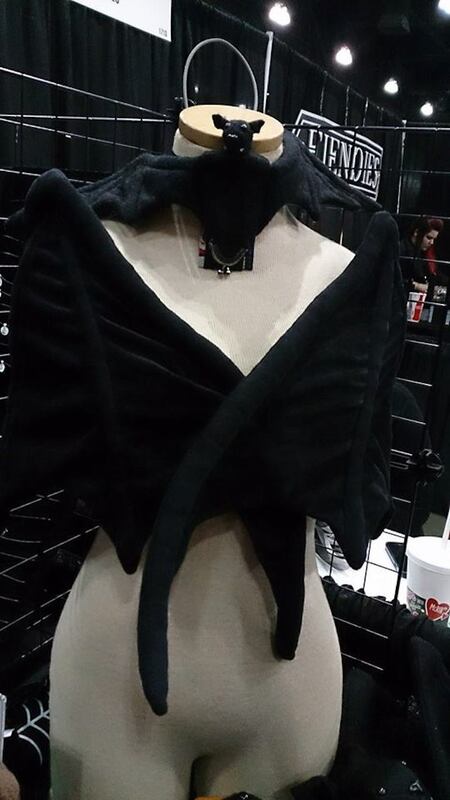 How about a bat wrap that is also a bat pack? Open the door to Th1rte3n’s Closet and you’ll find just what you need to keep you warm as long as you aren’t afraid of it sinking its fangs into your neck or shoulders. 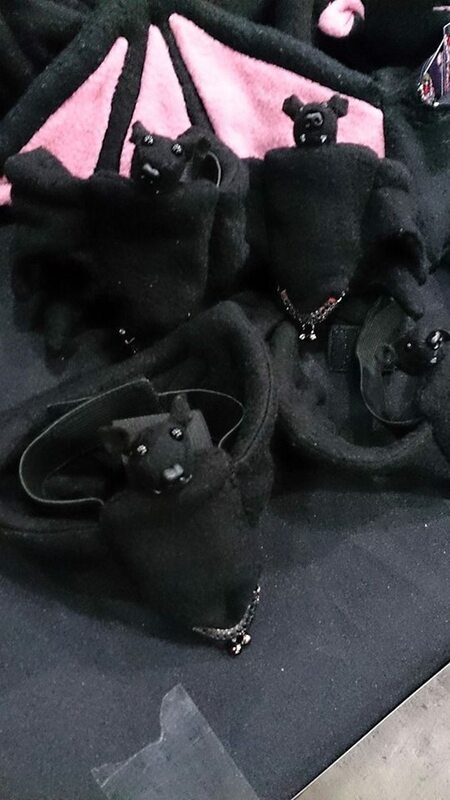 Also offered is a bat coin purse. You think that cats don’t care. That’s a part of their charm. They show very little devotion for anyone or anything but themselves. 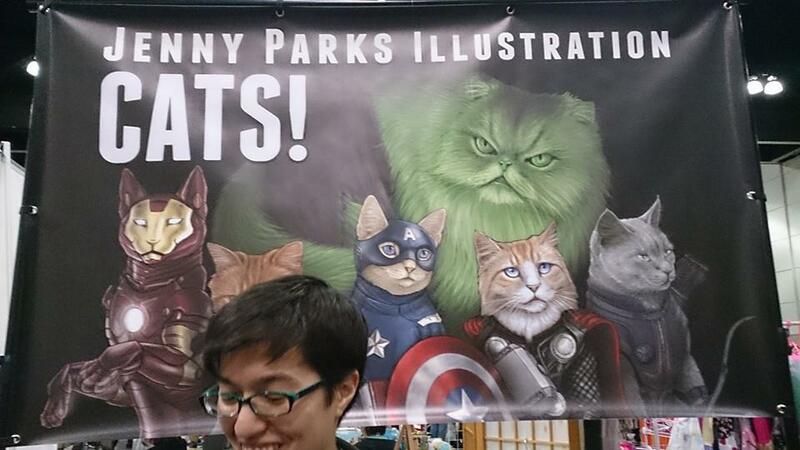 So cats as superheroes? What will they be saving? Fish for lunch? Arm the Animals feels that cats would make good animal rights activists and artist Jenny Parks imagines felines in lycra spandex costumes as well as that metal Iron Man suit. Arm the Animals gives you that Planet of the Apes revolution feel while Parks goes for realism…well, as realistic was you can be about cats saving the world and working with other superheroes. 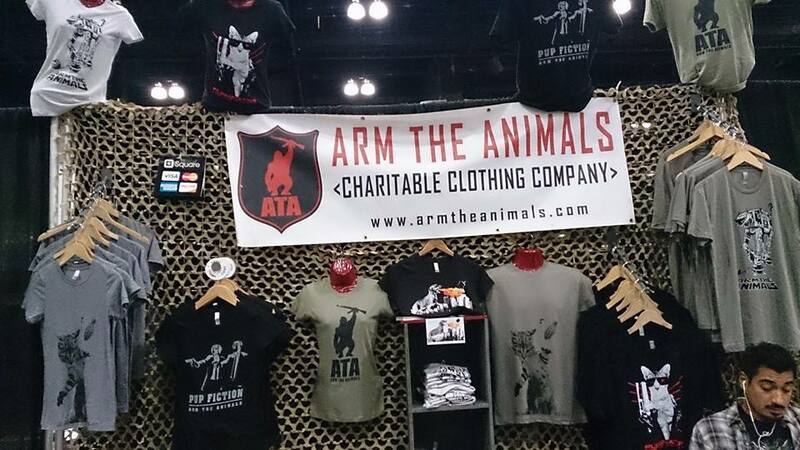 The company’s rescue partners are: Big Fluffy Dog Rescue, Barks of Love, Strangest Angeles Animal Rescue, Fresno Bully Rescue, The New York Bully Crew, DFW Pug Rescue, Almost Home, The Cattery, the House Rabbit Society and Priceless Pets Rescue. 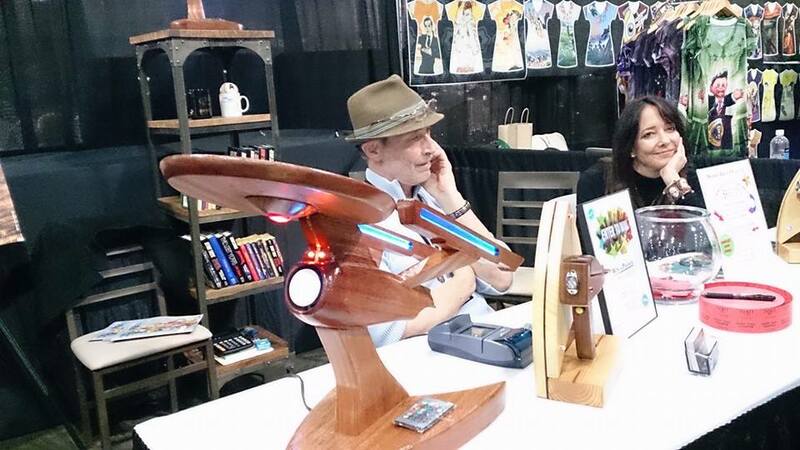 Do you need more Star Trek stuff, but your decor is more natural wood and you’re going green so the usual Star Trek stuff looks like it would be a better fit for the modern or neo-modern sleek interior designs? Don’t worry. Wood If I Could has just the right stuff for you including a lamp in the shape of the U.S.S. Enterprise that has several different light intensities. Of course, there is also a wood phaser. Are you old school? Then there’s Andromeda Designs Limited. President Scot Hogan’s company makes miniatures for the science fiction and fantasy fans. You can get old school action figures. You can also get planetary displays (and include Pluto or not), flying model rockets, limited editions and pre-finished miniatures. Got a thing for black and white? Like deceptively simple designs. 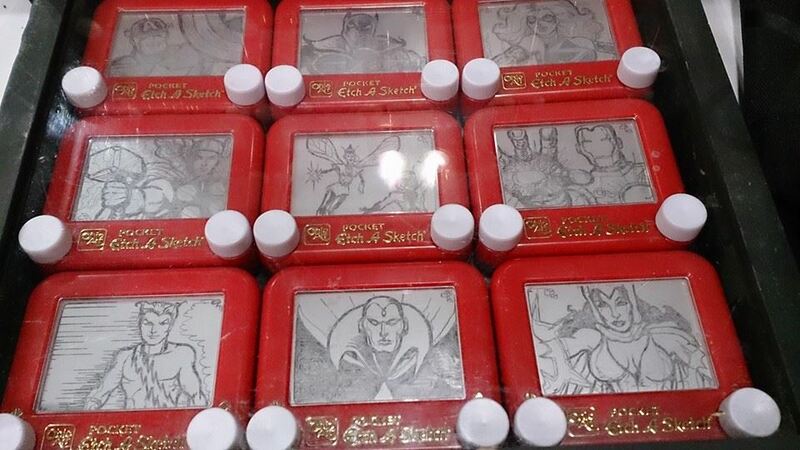 Lita Lopez takes commissions for the Amazing Etch Man, Christoph Brown. Other stark art, is the all-white 3D models from Bone Lab. 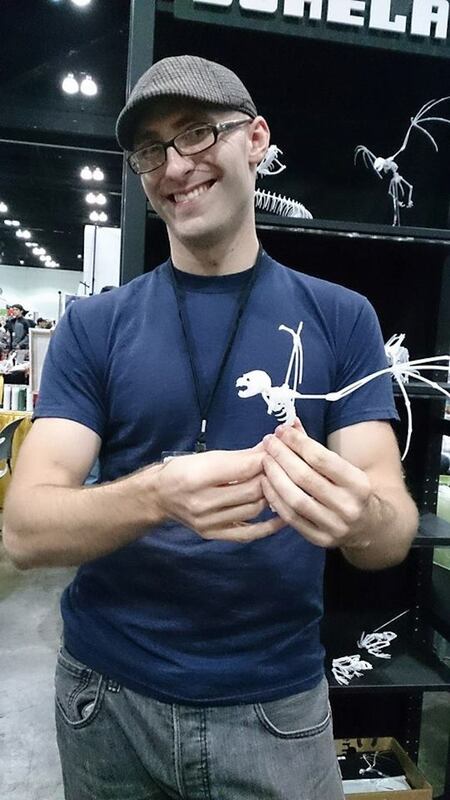 Artist/creator Greg Peltz creates skeletons for things that once existed and things that we hope never existed. There’s a pretty cool vampire bat, but we were leaning toward the Pentaceratops and waiting for the T-rex kit which Peltz says will be done by December. Bone Lab also has a rattlesnake kit and for you Walking Dead fans, a zombie clawing its way to the surface. You like things cute? Rizzo Michelle is a designer toy artist. She had Groot and others at Stan Lee’s Comikaze. Are you the selfie king or queen of your social network? Then you might want to check out Selfi3D. You could have a 3D doll of yourself, your parents or your friends or frenemies? No news on whether this has voodoo applications. Do you love gnomes? Do you love zombies? Or do you hate garden gnomes and want to see them die gruesome deaths? Or perhaps you’d just like to set the mood for Halloween or a marathon of “Walking Dead.” The answer to your problems is Zombie Gnomes. This company has been helping zombie-lovers everywhere since 2010 and insists that their merchandise is high quality cement and hand-painted. Each piece is then covered with UV protective exterior varnish. 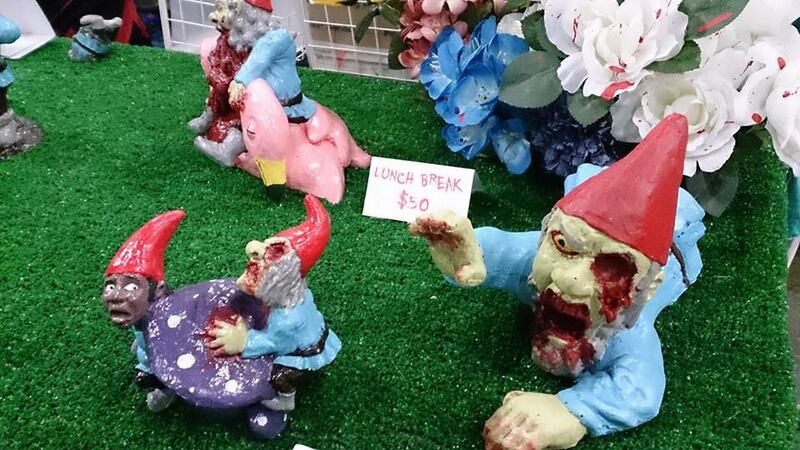 You can have your own “Lawn of the Dead” with feasting zombie gnomes, mother zombie gnomes and just plain bloody-mouthed gnomes rising from your garden grounds. This list should get you ready for holiday shopping for your favorite geek.